Gov. Jerry Brown has proposed a $52 billion plan to raise gas taxes and other fees to help repair California's roads. 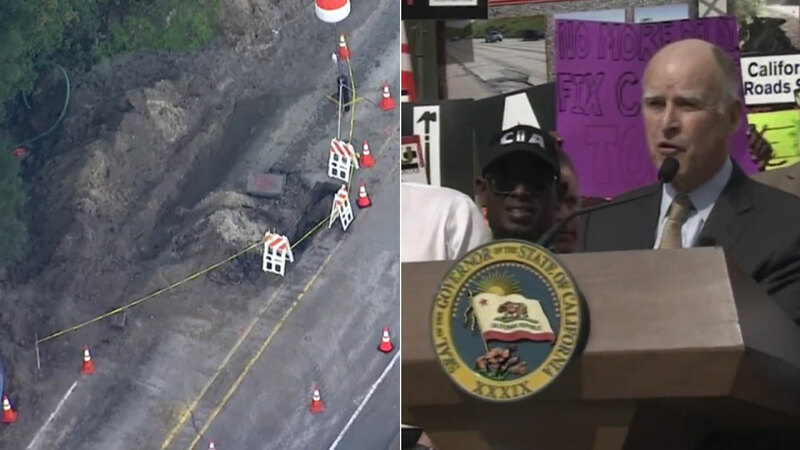 SACRAMENTO, Calif. -- California lawmakers on Thursday approved a $5-billion-a-year plan to boost the state's gas and vehicle taxes to pay for major road repairs, handing a victory to Gov. Jerry Brown who has lobbied for years for money to fix crumbling highways and bridges. Brown and top Democratic lawmakers overcame strong opposition from environmentalists and anti-tax crusaders to muster the two-thirds support required to raise taxes. "Tonight we did something," Brown told reporters in a hallway news conference outside his office. "There's real money and people can afford it...It helps bring jobs. It helps bring prosperity." Republicans blasted the plan to ask for more money from taxpayers in a state that already has a high tax burden. Some questioned why the state would raise taxes to repair its existing infrastructure without adding more lanes of traffic as the population swells. "We aren't taxing champagne and caviar here," said Sen. Ted Gaines, a Republican from El Dorado Hills outside Sacramento. "Transportation is a basic need to live and work and raise a family." Republicans said the state can fund road repairs with existing funds - an idea Democrats reject, contending it would require cuts to education and social services. "I don't think there are better options out there," Assemblyman Kevin McCarty, D-Sacramento, said. The evening votes in the Senate and Assembly capped a week of cajoling and arm-twisting by Brown, Assembly Speaker Anthony Rendon and Senate President Pro Tem Kevin de Leon. Contractors and construction unions blanketed television, radio and social media with $1 million of ads promoting the plan and targeting undecided lawmakers. Brown held rallies in the districts of targeted legislators and made unusual appearances before two legislative committees. Rudy Salas, an Assemblyman from Bakersfield, was the lone Democrat in the Assembly to vote against the bill. After he cast his vote, a number of fellow Democrats swarmed around his desk, shaking their heads. "You sold them out," Assemblywoman Lorena Gonzalez-Fletcher, a Democrat from San Diego, told him, adding that other Democrats had made the brave decision to support the bill. Three Democrats - Al Muratsuchi of Rancho Palos Verdes, Jim Cooper of Elk Grove and Tim Grayson of Concord - were the last to cast their votes in the Assembly. The vote count was frozen three votes shy of passing for more than 10 tense minutes while lawmakers huddled on the floor, pressuring the trio to vote for the bill. Sen. Anthony Cannella of Ceres was the only Republican to support the tax hike. Democratic Sen. Steve Glazer of Orinda was the only Senate Democrat opposed. "My constituents have told me loud and clear that they want any new taxes to be spent more wisely and effectively," Glazer said in a statement. He lobbied unsuccessfully for a provision that would ban strikes by Bay Area Rapid Transit workers. Cannella said he voted for the bill after Brown and Democratic leaders agreed to spend $400 million to extend a commuter train from San Jose to his Central Valley district and $100 million to build a parkway linking the University of California, Merced to Highway 99. The proposal aims to address a $59 billion backlog in deferred maintenance on state highways and $78 billion on local streets and roads. It's projected to raise $52.4 billion over 10 years, much of it to fix potholes and repair bridges but some for public transit and biking and walking trails. It would raise gas taxes by 12 cents a gallon - a 43 percent increase - and diesel taxes from 16 cents per gallon to 36 cents beginning Nov. 1. Diesel sales taxes would also rise. Drivers would also face a new annual fee to be paid with their vehicle registration, ranging from $25 to $175 depending on the value of their vehicle, starting next year. The taxes and fees would rise each year with inflation. Zero-emission vehicles will be charged a $100 annual fee starting in 2020. Separately, lawmakers voted to ask voters to amend the state constitution to require that the money be spent on transportation projects. The measure will be on the 2018 ballot. Republicans weren't convinced that the measure is strong enough, warning that creative lawyers will find a way around it. To win support from truckers, who face a big increase in taxes, Brown and legislative leaders agreed to restrict future regulations on greenhouse gas emissions related to commercial trucks. The change angered environmentalists, who worry it could impede regulations that indirectly affect truckers, such as restrictions on emissions at ports, warehouses, railyards and airports. "We are deeply disappointed that the Legislature chose to sacrifice our clean air plans just to appease one polluting industry in their haste to rush through a transportation funding bill," said Adrian Martinez, an attorney for Earthjustice. Republicans in the Assembly argued the bill doesn't do enough to guarantee existing revenue is spent responsibly. "Before we take a single dollar from Californians again that increase their taxes we have the duty to make sure that we first are spending every dollar they send us the best we can," said Assemblywoman Catharine Baker, a Bay Area Republican. "SB1 totally fails to do that."